WEST POINT – The owners of a West Point apartment complex said they are not responsible for the shooting death of a teenager on their property on New Year's Day. Devin Mitchell, a tight end/linebacker for Starkville High School, was shot and killed while visiting relatives at an apartment complex in West Point on New Year's Day. The lawsuit was filed in June in Clay County Circuit Court by the family of 16-year-old Devin Mitchell. It alleges negligence by the apartment owners and security guards. The Daily Times Leader reports that the apartment owners, in a response filed this past week, say the alleged actions by the shooter were unforeseen and were the sole reason behind the death of Mitchell. Police say Mitchell was visiting relatives at the Ridgewood Apartments in the 1300 block of East Main Street in West Point when he was shot in the head. Clay County 911 received calls at 2:55 a.m. of gunshots fired near the complex and when officers arrived, they found Mitchell suffering from a gunshot wound. He was later transported to North Mississippi Medical Center in Tupelo where he died. 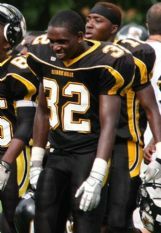 Mitchell was a member of the Starkville High football team that reached the Class 5A state title game that season. Mitchell, a tight end/linebacker, led Starkville with 34 catches for 772 yards and 10 touchdowns. He also played baseball. Tavaris “Frog” Collins was charged with his murder and he is still being held on $2.2 million bond. Tags: Devin Mitchell, Ridgewood Apartments, Starkville High School, Tavaris “Frog” Collins, West Point Miss. ← NAACP: Racial motivation behind Miss. hit-and-run?